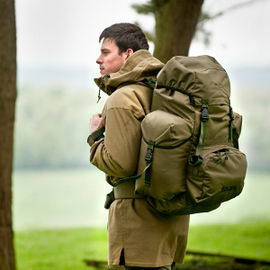 Order today and save 20% off the usual price of £95.00 in Woodlore's Sale. 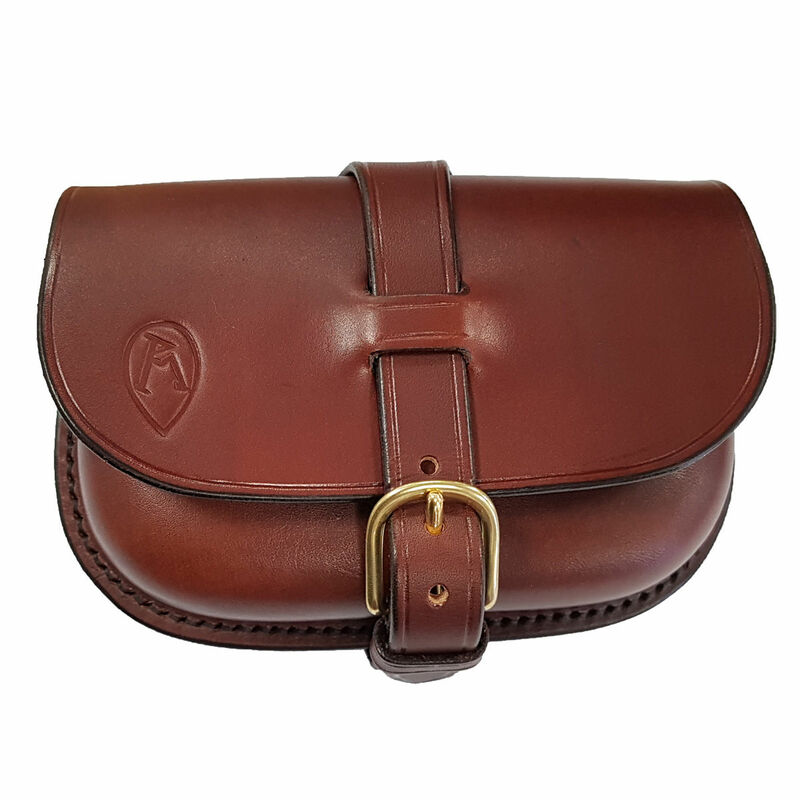 The Ray Mears Leather Belt Pouch is another exquisite, hand-stitched addition to the Ray Mears range of quality leather goods. Ray's exclusive logos can be found embossed on this exceptionally beautiful product: the ‘Snowshoe’ on the front flap and the ‘Ray Mears Bushcraft’ logo discreetly positioned on the back of the pouch. Like all of our hand-stitched leather products, this pouch is finished to an extremely high standard. The design incorporates a belt loop on the reverse which is made specifically to fit snugly on the Woodlore leather belt. The loop will accommodate most leather belts up to 38mm in width as well as canvas belts up to about 44mm in width. This pouch is adequately sized to store your most vital first aid equipment or any other essential items and is closed with a brass buckle on the front that allows for some adjustment. The rounded shape of the pouch with its flat rear panel against the body makes it comfortable to wear even when sitting. 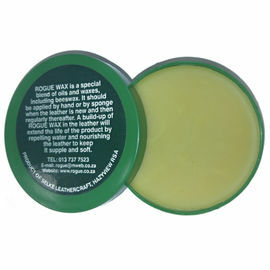 We can guarantee that you won't be disappointed with this product! All of our leather goods are hand-made in England by a craftswoman with over two decades of experience. All leathers are vegetable tanned with full, natural grain, and are hand-dyed in house to the unique Woodlore colour. For an insight into Ray’s ethos on our leather goods, please view our Leather Goods page. 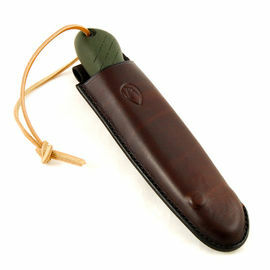 Ray Mears Leather Belt Pouch is rated 5/5 based on 18 customer reviews. Another successful purchase. Beautifully made handcrafted leather, an item you just know will last for many years and only improve with age. This was a birthday present to myself and although expensive, the quality is excellent. The leather work and stitching is what I would expect from a handmade product, and I have no doubt will outlast me. I have purchased several items from Woodlore over the years and am always guaranteed that the service and quality is top notch. Really well made, nice size. Attractive. Kinda pricey, but you’d be hard pressed to find something like this of equal quality for less! Truly a piece of art and beautifully well made. I almost have all the leather goods from Woodlore but I have to say this one is something else. Absolutely my favourite pouch. The quality and construction is amazing. I hesitated buying this as I wasn't sure that it would be comfortable to wear or suit my needs. Being a belt pouch it has to be comfortable standing, sitting or driving etc. 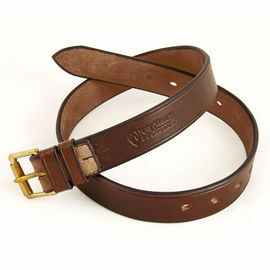 It's fine to wear though because it sits centred on the belt and doesn't droop. 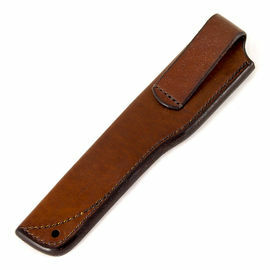 It's also made of solid, stiff leather and slides round your waist easily to adjust its position. I like to wear mine moving it from the front to the side as necessary. It is well made and looks like it will last a lifetime. It is also simple to open and close one-handed and being stiff with a wide opening flap, taking things out and putting things in is easy. For me it holds a passport and an iPhone 5 in it's own leather case, (you will have to measure your own phone). I've also got a decent sized pen knife and a pen in it. There is a small amount of depth left say for credit cards but I keep my credit cards separate in another smaller belt pouch because of the magnetic clasp on the phone pouch. (Magnets are not a good idea beside credit cards or anything else with a magnetic strip!) The pouch that I was sent is slightly different to the illustrated one. Instead of the small stitched leather bridge on the front flap through which the main strap passes, the front flap is simply slotted. It does the same job. It works for me. I'm very pleased with it and other people have made positive comments about it's quality. I'll be using it a lot. I know that it was relatively expensive but time, durability and utility should outweigh any initial cost. And it's a thing of beauty. Dear Robin, thank you for your comments on the Ray Mears Leather Belt Pouch and thank you for bringing the image to our attention. The design has recently been changed and we have now updated the image to reflect this. Hello. Once again, top service and top quality from RM. Recommend 100%. Nicely made but disappointed in the finish of the leather. The treatment is very uneven and blotchy. I understand the individuality of the leather as a natural product but this was not the quality or finish I expected for the price. The shop is excellent to do business with. Thank you for your review. I am sorry to hear that you are disappointed with the finish on your Ray Mears Leather Belt Pouch. As you point out, the leather is indeed an individual product. The shoulders that we use for this product are vegetable tanned with a full natural grain (the ‘skin’ surface is not buffed off to make it uniform) and are dyed by hand with a water based stain. Every piece of leather reacts slightly differently: the same dye batch can come out in a variety of tones across different pieces of leather and the surface can be very uniform or show variations according to the natural growth of the animal’s skin. We believe that all these variations are beautiful and each pouch is cut form a single shoulder to make sure these variations carry across the whole product. Other processes involved in the making of these pouches may also affect the appearance of the grain including the moulding process used to create the round shape which both stretches out the grain surface and compress it in different areas. We hope that all our leather products can be appreciated individually in the same way that they are made. Should you choose to keep the pouch I am sure that it will provide many years of good service. All Woodlore products are developed or chosen for quality and we will refund or replace, subject to our Terms and Conditions, any product which does not live up to our and your high expectations. Thanks for a quick delivery (less tan 24 hours door to door). The leather pouch is perfect for carrying smaller items when I'm not using a rucksack (first aid or compass, trail sharpening stone, fire stick, map). It's very well made and will last a life time. It is tight fitting on the belt, but I prefer it that way. There are times when I like to walk as light as possible, without a rucksack, and with my hands free. This pouch does the trick for carrying those small items that you might need along the trail. Thanks Ray/Woodlore. All the best, John. Another quality product from Woodlore, made from tough leather and all stitched with a strong strap and buckle, big enough to keep all the things you want to keep safe and at hand. 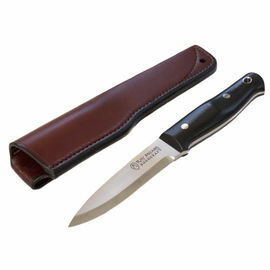 Mine holds a small sharpening stone, fire steel, tinder etc. I would highly recommend this leather belt pouch.